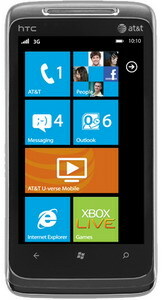 HTC Surround Windows Phone has been unveiled by AT&T at the official announcement of Windows Phone 7. The mobile phone comes with 1 GHz Qualcomm QSD8250 CPU, 800x480 3.8-inch capacitive display, 5MP camera, slide-out dual stereo speakers, and 16GB internal storage for all your applications. It will cost $199.99 on contract in the near future. The HTC Surround brings an immersive multimedia experience to an elegant, compact device. With slide-out dual stereo speakers that deliver rich, full sound in Dolby Mobile or SRS WOW HD surround sound, the HTC Surround blurs the line between home and mobile entertainment, making games, music and video on the go more enjoyable than ever. 0 comments on "HTC Surround Windows Phone for AT&T"